When treehouses were simple creations that lasted a long summer and could be built in a day, you could climb in and out on a single rope ladder. 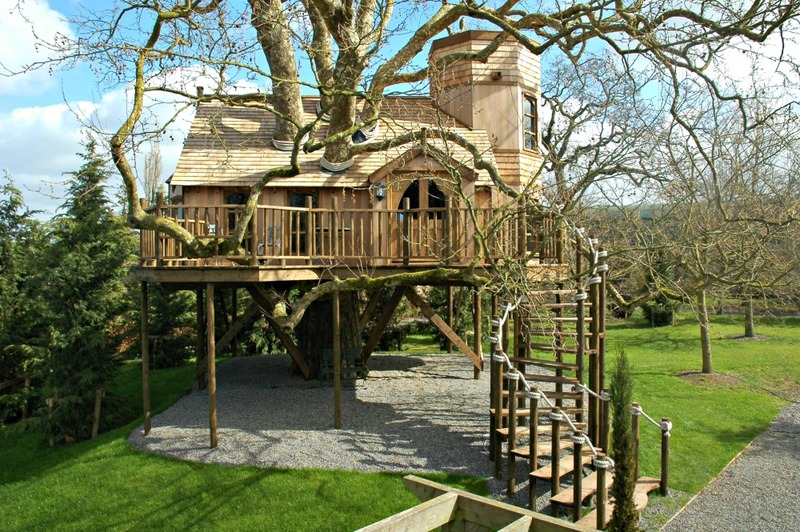 With a treehouse built to stand the test of time the number of ways to ascend and escape are as broad as the imagination. Rope bridges can be wobbly and adventurous , or sturdier and easier to navigate (more suitable for grownups, particularly after a glas of wine). When we designed the Sleepy Hollow Treehouse we knew we needed an intriguing way of connecting the different smaller elements that made up the treehouse. A suspended rope bridge felt like the best way to explore the treehouse in a fun but visually pleasing way. Begin your expedition on the rope bridge, and when it’s time to break from exploring, venture out to the rockwall and climb back down to the earth. At the heart of every fairy tale is a tower. And leading to that tower is a spiral staircase winding its way up towards promises of romance and discovery. But it’s more than that. The spiral staircase sweeps us away to a place where, far-removed from the pressures of everyday life, we can give over to imagination. So, when we built the The Treehouse Castle, it simply had to have a spiral staircase leading up to its deck. Built on the grounds of an Irish country house, The Treehouse Castle was designed to echo the 17th century architecture of the main house. This includes Tudor gothic stained glass windows and, of course, a tower. When we designed the Nook Treehouse we knew it wouldn’t be complete without a zipwire. In addition to making it a serene escape for the grown-ups, we wanted it to be a unique play area for the kids too. 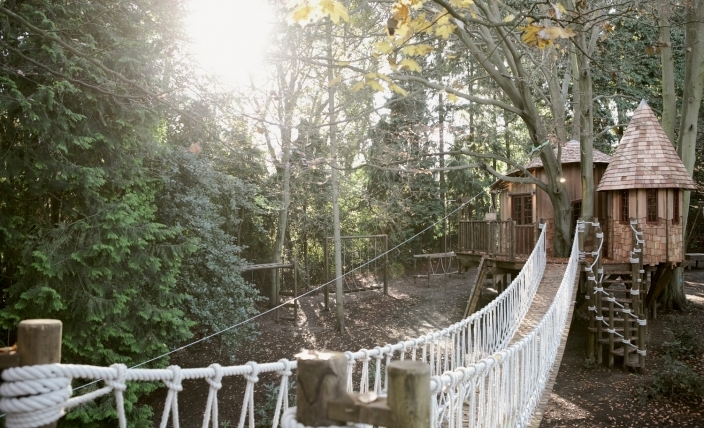 With a bespoke climbing wall, a rope bridge and an adventure trail that leads to a treetop play deck, the Nook Tree House epitomises the perfect adventure. But even the perfect adventure has to end. At least when the kids can exit the tree house on a 45 metre zip wire, calling them in for dinner should be a little easier. Many of the treehouses we have designed have featured built in slides. They’re great fun for kids and growns up alike – when in need of an escape route or looking for a quick pick-me-up. The Fibonacci inspired treehouse features perhaps the grandest slide so far: a formidable 23m long slide designed for the so-called “big kids”. Things are classic for a reason. 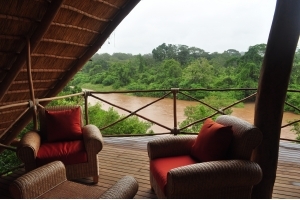 There is nothing quite like scrambling up an old school rope ladder, feeling like a big kid, to emerge into a beautiful bespoke treehouse. 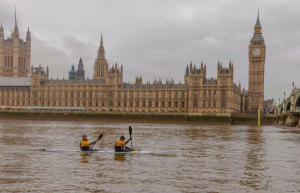 Of course you’re going to want an alternative route too. A walkway that slowly inclines, winding up through the trees is a great way to integrate a treehouse with its surroundings. The small stroll there gives the visitor the opportunity to reframe their thoughts and reconnect with the sights, sounds and textures of their environment. 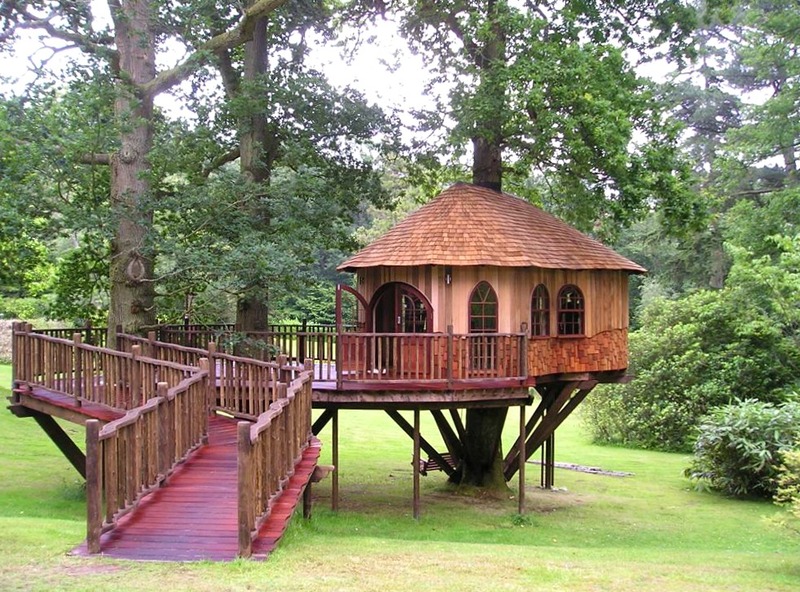 It’s also a wheelchair friendly way to ascend to your treehouse so can really help with accessibility. We built one tree-weaving walkway for the Hideaway Treehouse and it really helped the make the treehouse look hidden in the foliage. The ultimate entrance to a fort-like play area has to be the trap door. It gives the place a Robinson Crusoe feel, climbing down the wooden ladder and shutting the trapdoor behind for a quick escape, not to be followed. 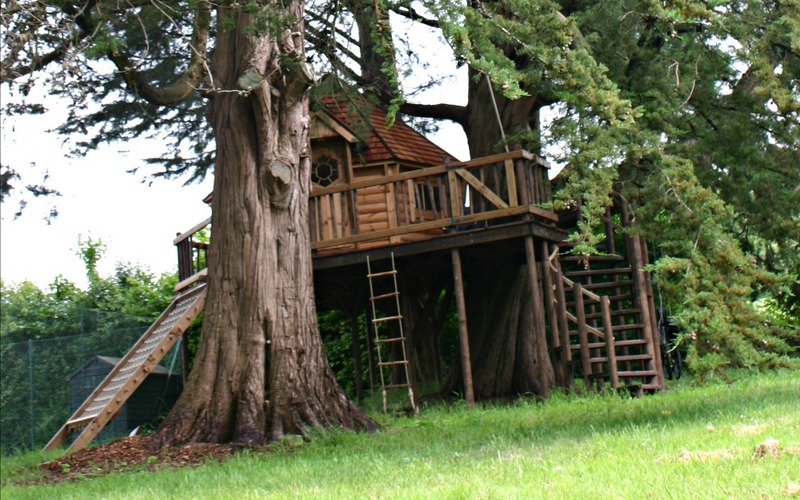 The Tree House Fort was designed for boys to play in and is full of fun features like monkey bars to connect the different areas. The trap door makes for an excellent feature for kids at play and is sure to stimulate their teeming imaginations! That’s not to say it can’t work for a grown up treehouse too, a subtly hidden trapdoor, perhaps beneath as strategically placed rug, can be an incredibly fun feature for adults too. 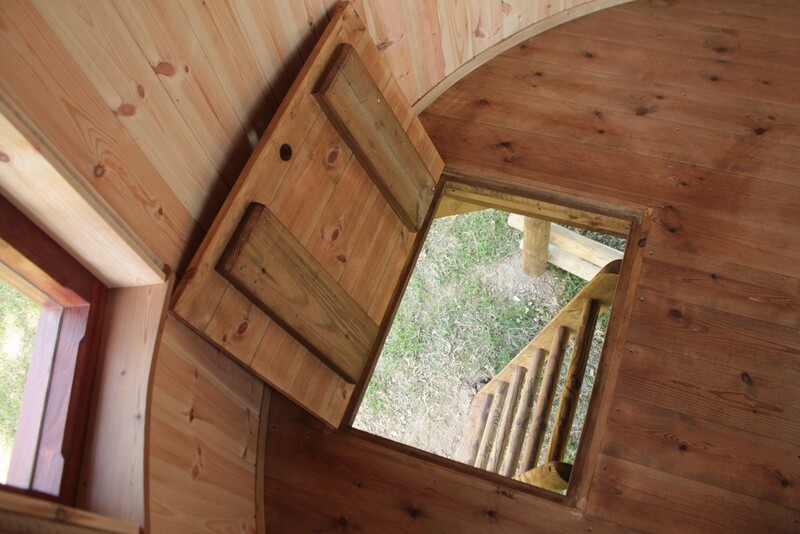 Secret tunnels add to the magic of a treehouse, having a hidden entrance makes it all the more exciting. We designed The Rookery at Pensthorpe WildRootz with this very much in mind. There are many ways to get into The Rookery, but to get to its main feature, the maze, you have to find the entrance to the secret tunnel. The secret tunnel emerges at a hatch that reveals the inner-core of The Rookery’s maze. This fills the treehouse with an enticing air of mystery. Equally, if you’re building a treehouse just for you and a select few, a secret tunnel can add to that feeling of exclusivity and seclusion from the rest of the world. This can be a great feature for an art studio, writing retreat or a simple peaceful spot. The route of entry and exit to any building may seem simply like a means to an end: getting inside or getting out. But there is something particularly powerful about how you enter and exit a treehouse. The entrance sets expectations for what awaits – the romantic escape at the top of the spiral staircase or the playroom at the end of the suspended rope bridge. And the exit can make leaving a hideaway as much of an adventure as discovering it – whizzing down a zipline or gliding down a slide. These experiences return us to a time when the thrill of the unexpected and the simple pleasure of being outside were all the entertainment and escape we needed. The good news is that you can return to that place – all you need is a clever route to get there.